Starbuck crash-lands on the doomed Cylon world. Cover A of this issue shows Cassiopeia wearing the tight black outfit she wore in "The Living Legend" Part 2. 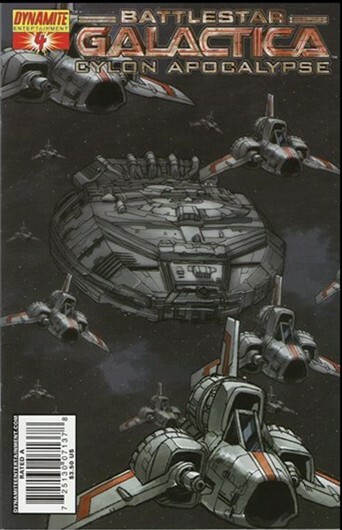 Notice that, on Cover B, the Galactica is missing it's landing bays! Maybe artist Pat Lee was influenced by the Galactica of BSG2000, which had the ability to retract its landing bays. On page 4, Starbuck refers to Cylons as "blenders". In BSG2000, the Cylons are often referred to as another kitchen appliance, toasters. On page 7, Apollo quotes Starbuck as having said, "A Viper pilot only flies three fighters--the one he trains in, the one he escapes from, and the one he dies in." Starbuck said this in "The Young Lords", quoting his old flight instructor. Also on page 7, Apollo makes a reference to Colonial War College. The term may have been borrowed by the writer from BSG2000, where it was used in at least one episode; this is the first mention of the term in BSG70. On page 8, Commander Adama plans to use a gravitic warhead to collapse the Canopus wormhole behind them after the fleet passes through to prevent the Cylons from following. This is the first use of the term "gravitic warhead" in BSG; it may have been borrowed from the Star Trek: Voyager episode "The Omega Directive"; this may be a sort of in-joke to the fact that the crew of the Voyager found themselves trapped in the Delta Quadrant after passing through a wormhole, much as the fleet is about to do here. Page 15 reveals that the laser gun of a Colonial Warrior has a power level indicator built into the back of the weapon. On page 20, Boomer refers to the Cylon planet as a felgerhole, obviously a partial use of the Colonial expletive "felgercarb". Colonel Tigh indicates the fleet still has some of the nano-cybrid weapons left. Will they continue to use them against the Cylons? Do they have the capability to manufacture more? Was Starbuck planning to propose to Cassiopeia? He bought a fancy ring of Gemonese sapphires for her in "Bombardment", but he's not seen giving it to her, and seems to chicken out of telling her whatever he was going to tell her at the end of this issue. Did the fleet pass through the Canopus wormhole? At the end of the issue, Adama orders the fleet on the course through it, but we don't actually see it happen. If so, did he detonate a gravitic warhead as he had planned to destroy the wormhole and prevent the Cylons from passing through? Even if he did, what's to say the Cylons have not already sent ships through and set up bases on the other side, especially considering how close the Cylon planet was to the wormhole.